I have always wanted to wear dresses and skirts, beautiful girly blouses too but, with my ample bosom, small waist and curvy hips, No Way could I walk into my local Macy’s and walk out with something gorgeous that hugged my curves in a lady-like way and made me feel and look beautiful. Ladies with my curvy figure, you know what I am talking about. If the dress top fits then it is so big and unflattering in the middle, you look like you are expecting, or, if you can find a blouse that buttons across your breasts, the rest is so big in the waist and sides that you just want to yank it off. Jenny Dress in Snow White Print. The colors are incredible on this sundress and it is boned and fused through the bodice to give it amazing structure. I actually wore it for the first time to a high-profile work event, topped with a sunny yellow cardigan. Evelyn dress in yellow and black vintage rose print. This dress is a vintage style party dress with a gathered bust, side zipper, and matching removable bolero shrug. The peasant-style bodice flatters a range of bust sizes, has a slimming fit through the waist, and then opens up in a full vintage style skirt I have a photo shoot next weekend and will definitely be wearing this stunning dress (stay tuned for pics to come). Wore this one yesterday and it is my FAVORITE!! 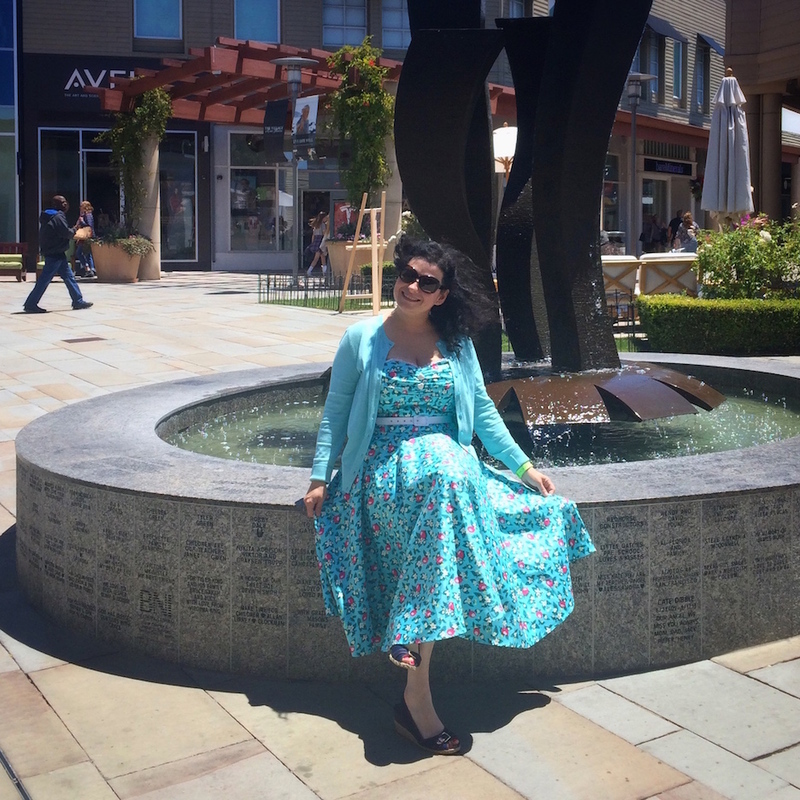 The Nancy dress in Blue Lemonade print. It has adjustable straps, a shallow sweetheart neckline trimmed with a tiny lace ruffle, two decorative heart buttons, and a slightly padded bust with a ruched line down the middle creates definition and coverage and a full skirt. Non-stop compliments!! The pattern and colors are so gorgeous, you feel incredible wearing it. Pic of me sitting by a fountain and it was so incredibly windy!! 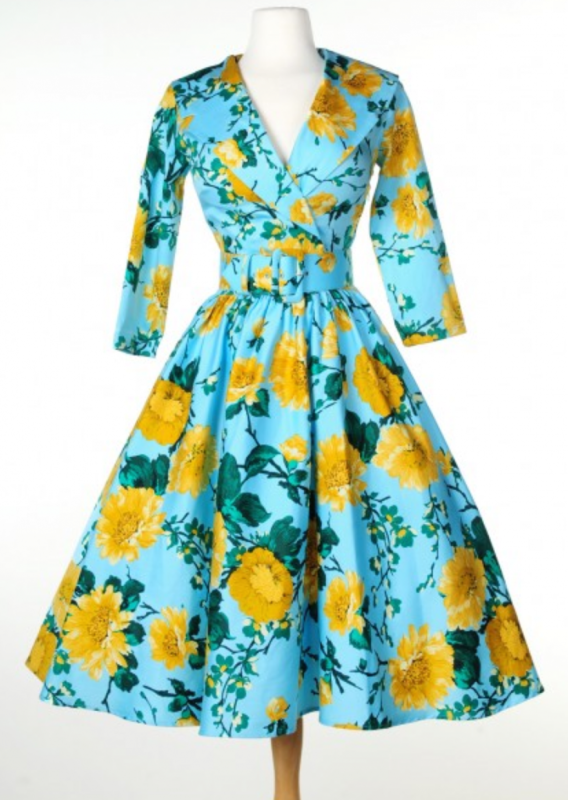 The Birdie Dress in blue with yellow peony flowers. 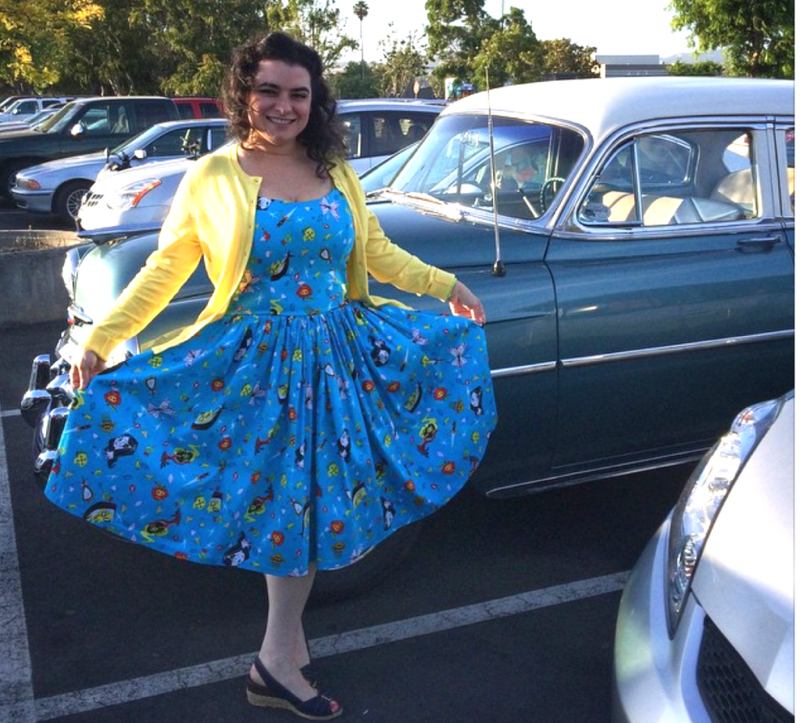 This was my very first dress from pinupgirlclothing. When it arrived I was so excited to put it on. The fit was really incredible, it hugged me just where I needed it to and all I wanted to do was twirl. The dress has a full skirt, wide notched collar creating a classic, polished silhouette. Finished off with a side zipper and wide matching belt, this lovely dress is made of a rich cotton sateen. I really felt like I was wearing a magical creation from the 1950s (stay tuned for pics, I will wear it at my photo shoot next week).